Global stocks sell-off: The biggest U.S. losers on China’s Black Monday. Which U.S. Stocks Got Hit Hardest in Monday’s Global Sell-Off? Now that Monday’s closing bell has tolled, let’s assess the damage. 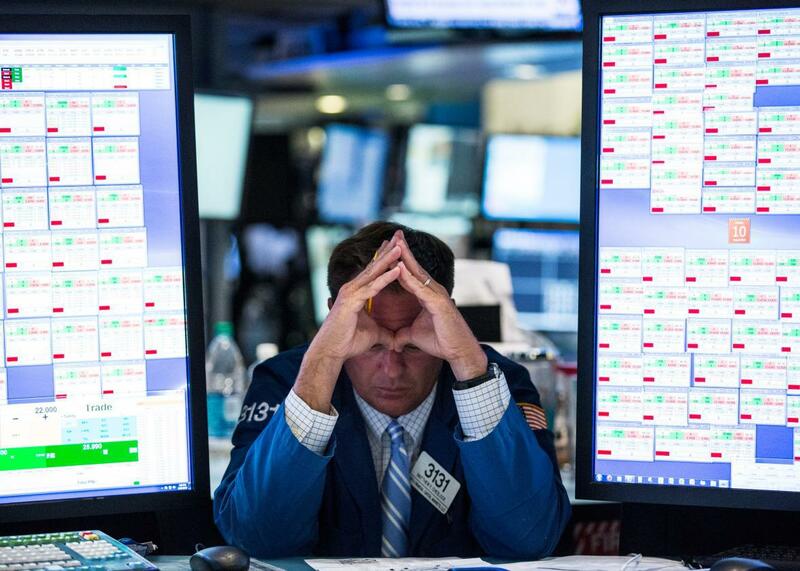 The S&P 500 plunged 77.7 points or 3.94 percent. The Dow lost 588 points or 3.58 percent. The Nasdaq shed 180 points or 3.82 percent. It was the fifth straight day that U.S. stocks fell amid a broader sell-off around the globe. The S&P headed into a correction for the first time since 2011 and is on track for its worst August performance in 17 years. Hardest hit were commodity and energy shares. Six of the S&P 500’s Top 10 worst performers on Monday were oil and gas companies, while copper and gold producer Freeport-McMoran was seventh. In the tech-heavy Nasdaq, Citrix Systems led the bloodbath with an 8.7 percent drop, closely followed by Baidu (down 7.1 percent), and Netflix (down 6.5 percent). Over at the Dow, the downturn was less severe—the worst drop was Cisco’s 4.2 percent, which looks practically rosy compared with the numbers being posted by stocks in the other two major indices. Overall, though, pretty much everyone was in the red. On bigger-name tech companies, Amazon tanked 5.3 percent, Tesla 4.3 percent, and Yahoo 4.2 percent. 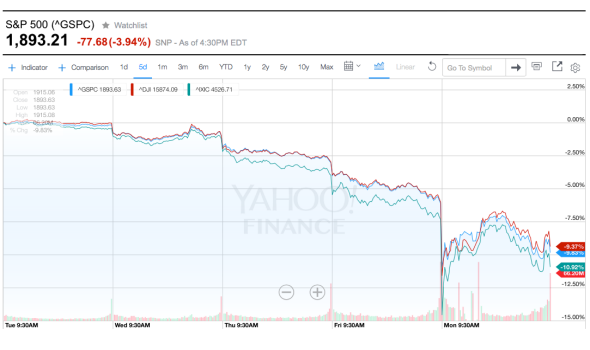 In blue chips, McDonald’s lost 3.7 percent and Goldman 3.5 percent. General Motors toppled 5.5 percent, Ford fell 4.9 percent, American Airlines Group slid 4.6 percent—you get the picture. I’ll stop before I run out of verbs. Why is this all happening? People are worried about China. People are worried about the Fed. People are less worried about Apple, but Apple might need to be worried about the note its chief executive sent to reassure investors earlier in the day. Don’t believe anyone screaming to buy cheap shares. Also, don’t liquidate your equity holdings for canned goods. No one really knows what’s going on. Tune in tomorrow. Five days of sliding U.S. stocks.